We had a wonderful trip!!! Missing it all already and scheming going back to the Galapagos in the future... :) We wanted a responsible tour operator for our trip to Galapagos. 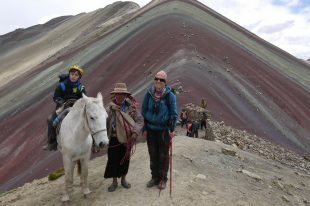 The reason we chose Andean Trails over another provider was because we appreciated the professionalism, open and honest advice, and the insights and options for the trips suggested. Isabela was our favourite Island so we were happy to be spending more time there. Also happy that we didn’t have that much time on Sante Cruz - very different vibe! Los Tuneles was definitely a highlight! We saw a huge school of golden rays on the way in and the guide let us hop off to snorkel with them, lots of sleeping white tip sharks, grazing turtles, and sea horses. And some manta rays on the way! The scenery is also very special. We absolutely loved that day. Kicker Rock trip was excellent. The guide and the boat we had were the best of the overall experience. Snorkelling between the rocks was an amazing experience. We saw loads of sharks but unfortunately didn’t spot a hammerhead (divers did though)! Española and North Seymour were also great days for bird spotting, snorkelling and exploring the uninhabited islands. We weren’t disappointed we didn’t get to go to Santa Fe in the end, and one of the guides was swearing by North Seymour being better. Staying on the islands felt like we were contributing to the local communities, compared to the boats that locals told us “only leave trash behind.” I also hope that entry fees do help to contribute to the conservation efforts. I was worried that tourism on the islands is not helping the cause but it seems to be welcome there, and that they are at least trying to put the rules in place to make sure tourism is not just ruining the place. This certainly was one of our best trips ever!